At this point, even the most casual observer can see when Frank Clark goes tearing around the edge with no consideration of passing lanes. 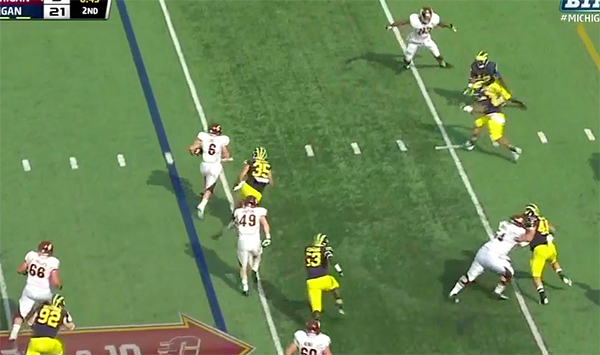 But while rewatching the CMU game, I noticed a play in which Mario Ojemudia and Brennen Beyer did the same, only in this instance, Greg Mattison called for the reckless rush from his defensive ends. With CMU facing a third and ten in the second quarter, Mattison called for a formation that was all the buzz in the NFL two years ago: the wide nine. The formation is named because of the alignment of the defensive ends, who are playing "nine tech", or aligned outside of the tight ends. Even if there aren't tight ends (like on this play), the DEs still play at the nine tech. This is a pure pass-rushing formation. 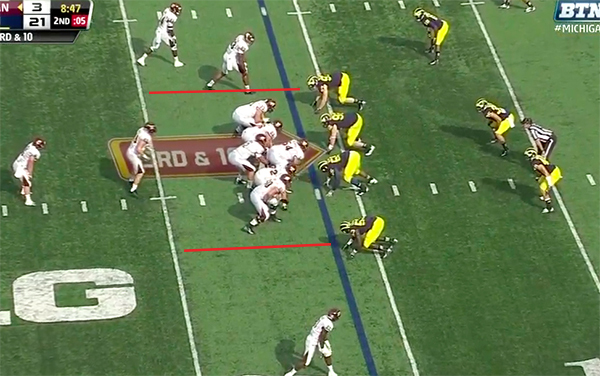 Prior to the snap, the inside receiver from CMU's bunch formation motions into the backfield. Ojemudia and Beyer remain at the nine tech, but Beyer actually slides a few steps inside. My guess is that he lined up outside of the motion man in the original formation and moved after the offensive shift. At the snap, Ojemudia rockets off the line and sheds the right tackle (highlighted; bottom). 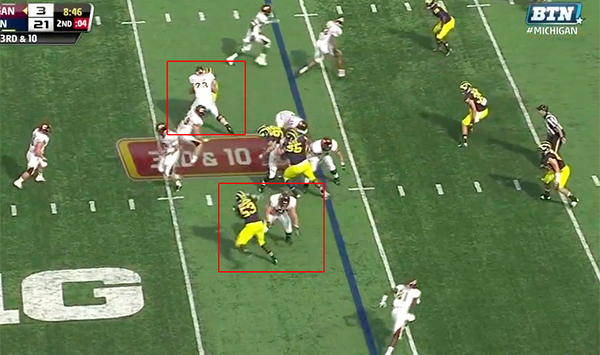 Beyer engages with the left tackle (highlighted; top) but will quickly shed him to get into the backfield. Neither player is considering their run fill responsibilities, opening huge holes between the offensive tackles and guards. CMU is running a strongside lead iso, and because of the defensive front, Michigan has completely vacated the strongside B gap. You can see Ojemudia and Beyer now both closing in on the backfield, but neither has the momentum to get to the running back. 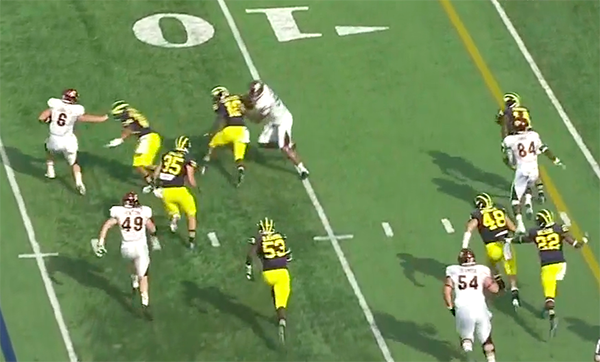 Meanwhile, CMU's lead blocker has attempted to block one of Michigan's DTs who was already falling to the ground. Central's fullback (#49) is now falling behind the ball carrier (#6). Without the lead blocker, CMU's running back is staring down Joe Bolden. Bolden freezes and allows Central's running back to bounce outside. 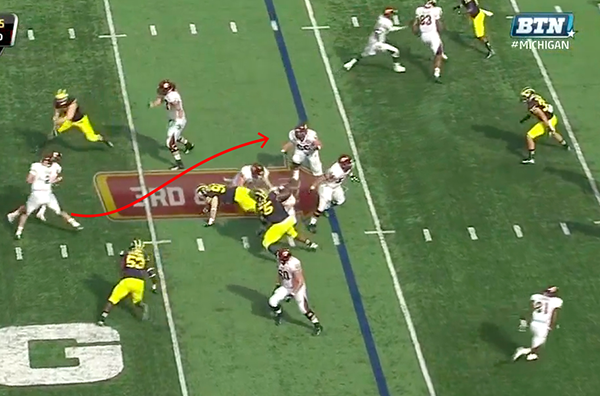 Michigan has reinforcements rallying to the ball, including Ojemudia who you can see chasing the play. As a side note, how nice is it to see seven Michigan defenders in this screen? 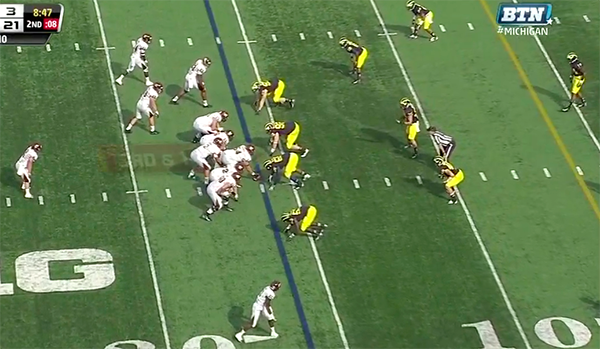 Mattison can somewhat safely call for the wide nine in this scenario. With a chance to get Central off of the field, giving up 5-8 yards on a scramble or, as is the case here, designed run, won't hurt Michigan. But don't expect to see this strategy employed against Braxton Miller or Kain Colter. This play is designed to have the defensive ends disregard their run responsibilities in favor of getting into the backfield. The five-wide underneath zone defenders act as the safety valve if the offense checks into a play that will attack the relentless pass rush. However, had the CMU fullback blocked Bolden, Delonte Hollowell would have been forced to come downhill and make a tackle in the middle of the field, so this is still a risky proposition. This play forces me to reconsider at least some of Frank Clark's irresponsible pass rush. Mattison values getting to the quarterback with only four pass rushers enough to install the wide nine. But Clark's history does not reveal many of these situations. Chances are good that Clark takes this aspect of the defense as a green light to so consistently ignore his run fits. Nice analysis, Chris. I watched the Central game on mobile devices while traveling, and I didn't notice the wide-9s. Although I don't recall seeing it against ND, it seems like another nice tool to break out on obvious passing situations against immobile quarterbacks.